I once heard a transgender woman give a talk about the process of socially transitioning to being recognized as a woman. She discussed various decisions she made in taking some final critical steps toward the social identity of woman. She talked at length about her hair. She asked, “What kind of woman am I and how is my haircut going to indicate that?” She talked about being preoccupied with her hair for a long time as she attempted to figure out a cut and style that “felt right.” But what struck me the most was her discussion of carrying a purse. She said that getting used to carrying a purse everywhere was one of the more challenging elements of the transition. If asked what I thought would be a significant everyday challenge if I were a woman, I don’t think purse would have been high on my list. But, it was high on hers. She discussed remembering to bring it, how to carry it, norms surrounding purse protection in public, but also more intimate details like: what belongs in a purse? Purses and wallets are gendered spaces. There’s nothing inherent in men’s and women’s constitutions that naturally recommends carrying money and belongings in different containers. Like the use of urinals in men’s restrooms, wallets and purses are a way of producing understandings of gender difference rather than as a natural consequence of differences. I got the idea for this post after reading Christena Nippert-Eng’s book, Islands of Privacy — a sociological study of privacy in everyday life. One chapter deals specifically with wallets and purses. In it, Nippert-Eng discusses one way she interviewed her participants about privacy. She used participants’ wallets and purses as a means of getting them to think more critically about privacy. Participants were asked to empty the contents of their wallets and purses and to form two piles with the contents: “more private” and “more public.” As they sifted through the contents of their wallets and purses, they talked about why they carried what they carried as well as how and why they thought about it as public or private. After collecting responses, she documented all of the contents and created categories and distinctions between objects based on how people thought about them as public or private. One question that was clearly related to privacy was whether the objects were personally meaningful to the participant. Invariably, objects defined as more personally meaningful were also considered more private. Another question that routinely arose as participants made sense of the objects they carry around everyday was how damaging it might be for participants if a specific object was taken. 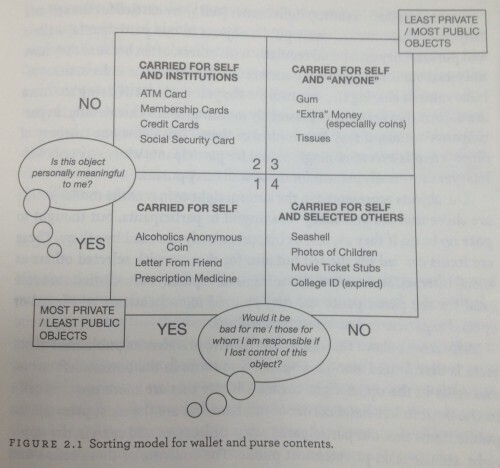 Based on this findings, she creates a useful table delineating participants concerns surrounding and understandings of the objects they carry with them (see left). Just for clarification, there’s sort of a sliding scale of privacy going from most to least private as one proceeds from the bottom left cell to the top right cell. Thus, items classified by participants in the lower left cell (1) are the most private objects. Here, participants identified things like prescription medications, letters from friends, and a variety of personally meaningful objects that were thought of as completely private and carried only for the self. Other items were still considered private, but “less private” than objects in cell 1 because they were shared selectively. Consider cell 2. While credit cards, bank cards, memberships, credit cards and money were all classified as “private,” individual’s also thought of them as “more public” than object in cell 1 because they were required to share these objects with institutions throughout their lives. Similarly, some objects were thought of as “private,” but were also carried to share with certain others, such as photographs of children (cell 4). Finally, items classified in the top right cell (3) are the most public objects in wallets and purses—carried for the self and, potentially, “anyone” else. Items here include things like tissues, lip balm, money classified as “extra,” gum, breath mints, etc. Objects from most of the cells exist in both wallets and purses, but not all of them. The contents of cell 3 (containing the “most public” objects in wallets and purses) are inequitably distributed between wallets and purses. As Nippert-Eng writes, “This is the one category of objects that is overwhelmingly absent for participants who carry only wallets, yet universally present for those who carry purses” (here: 130). She also found that some of her participants only carried objects all fitting the same cell in the above table. These participants — universally “wallet carriers” in her sample — carry only objects necessary for institutional transactions (cell 2). This is, I believe, a wonderful analysis of one of the more subtle ways in which gender is accomplished in daily life. Certain objects are simply more likely to be carried in purses. Interestingly, this class of “feminine” objects are also objects that play a critical role in social interactions. Indeed, many of us are able to travel without these objects because we can “count on” purse-carriers as having them. Things like packs of gum, tissues, breath mints and more might seem like inconsequential objects. But, they play a crucial role in social interactions, and many of us count on purse-carriers to provide us with these objects when we are “in need.” It’s an aspect of care work by which some (those carrying purses) care for others (those without purses). And if they’re any good at it, the caring goes virtually unacknowledged, though potentially highly acknowledged when these objects are absent in purses. Children routinely ask their mothers for objects they presume they’ll be carrying in their purses. Indeed, these objects may be carried in anticipation of such requests. It’s a small aspect of doing gender, but a significant element of social interactions and life. When I was learning about interviewing and ethnography, I was told to always carry a pack of gum, a pack of cigarettes (something “lite”), and a lighter. My professor told me, “It opens people up. It’s a small gesture that comforts people–puts them at ease.” These are the ways you might want people to feel if you’re asking them to “open up” for you. I still remember my first foray into “the field.” I bought my gum and cigarettes (objects I don’t typically carry) and the first thought I had was, “Where the heck am I going to keep these things?” What I didn’t realize at the time was that I was asking an intensely gendered question. Tristan Bridges is a sociologist of gender and sexuality at the College at Brockport (SUNY). Dr. Bridges blogs about some of this research and more at Inequality by (Interior) Design. You can follow him on twitter @tristanbphd. One glaring problem with the wallet/purse dichotomy is that non-purse users frequently distribute those Column 3 items, among others, into other places outside of their wallets. Non-purse-users carry things like phones, keys, tissues, cigarettes, lighters, mints, gum, and loose change in their pockets, backpacks, and briefcases. It is beyond obvious that most of these items won't be found in wallets, as they don't fit there. One thing that does happen when changing from typical men's clothing to form-fitting women's clothing is that pockets get smaller and less accommodating to bulky objects, making the purse seem like a better idea. Of course, I know plenty of women who prefer not to use purses at all, as they make it far too easy to have many valuable items lost or stolen at once. As an accessory, I'd say they are more closely related to the gendering of clothes than to gendered discrepancies of what one needs to carry around. As for urinals, they aren't merely a way of justifying toilet segregation; they do happen to save a great deal of water and space, to an extent that actually makes a difference when large numbers of people are being accommodated. Minor nitpick, but in the second paragraph after the image you list "credit cards" twice. Also, I think it is kind of silly to say that people with wallets don't keep the contents of cell 3 in there. You know who else doesn't store tissues and gum in their wallets? People with purses! Lots of wallet users also have gum and cigarettes on them, that's what pockets are for. It seems like a rather glaring omission to not have asked participants to empty their pockets, as if keeping your lighter there were somehow significantly different than keeping your lighter in your purse. There crops up from time to time a discussion of why more men don't get custody of children, why we see women as more "maternal" and therefore better deserving of the children. And I am usually on the mother's side, even though I think the male is every bit as capable and caring. I think this article is the first time I've really figured out why. Because of a social process of nurture (not nature) that causes a woman's default setting to be "caretaker," while the male default setting is "he who takes," even on the smallest level. Given a choice between someone who looks after others and facilitates communication as a matter of social instinct and those who do not, I know who I, if I were a judge, would choose. And we see this sort of behavior so often it becomes invisible, we really only pick it up on a subconscious level. If mens' default setting switched so that they were also doing these tiny invisible social cues, would our attitude on their paternal instincts change as well? I know it's not a direct comment to the article, but I found the idea intriguing. I am a cis woman, and I carry a big purse. I have a lot of 'category three' objects that are not covered here and that wouldn't fit in pockets (as suggested by fellow commenters), like a first aid kit, a sewing kit, a flashlight, pads and tampons, and a variety of tools. I often am asked for objects from my 'purse of holding' by my adult friends (and I am most often asked by men, as they cannot carry any of this for themselves), and they pretty much expect me to have whatever they need. However, these same people will often mock me for carrying such a large purse. Seeing the gendered nature of carrying potentially-communal items explained in this article really oriented this somewhat uncomfortable experience for me as a gesture of unexamined male privilege and even possibly unconscious sexism from my friends. I will continue to carry my purse, because I like being prepared, but now I feel more equipped to broach with people with the larger context of their mockery. Thank you. Andrew and Japaniard point out pockets should have been included in the study, and while I think they are correct, my suspicion is that wouldn't have changed the results all that much. The men I know don't carry gum, tissues, band aids, breath mints - and certainly not all of those (as I do!). There are likely some men who do carry these social interaction objects in their pockets, but I don't find this happens "frequently" or that "lots" of wallet carriers do this. A more complete study including pockets would be nice - but I think Dr. Bridges' analysis is bang-on. I've never carried a purse in my 30 odd years. What's interesting is how distressing this decision is to some people. My mother used to buy me a new purse for every holiday. If I ever misplaced my debit card, my father would tell me it's because I don't have a purse (I also don't carry a wallet, but I was never pressured to do so.) Other relatives, mostly female, would ask why I didn't carry one or would buy me one. I don't 'code' female in many other ways (v. short hair in a 'male' style, absolutely TERRIBLE fashion sense), but this was the only one I ever got a lot of flack for. In my social circle it is usual for everyone (men and women) to carry bags of some type (often bicycle pannier bags, for ease of attaching to bicycles but also rucksacks, handbags, and other options) at most times. I'm not really sure how one would distinguish a "purse" from any other sort of "bag" into which one might put one's phone/wallet/keys/tissues/novel/knitting/etc. I don't often spend time with men who have gone out with only what they can carry in their pockets; and even then most men seem to fit their phones, keys, etc. into pockets (but not of course into their wallets - wallets clearly do not have space to contain large phones) and could presumably manage tissues, gum, etc. if they felt like it. It often irritates me that men's formal wear has useful pockets, whilst women's formal wear comes with the expectation that one will carry a decorative bag (often too small to contain my usual wallet, keys, phone; let alone novel, knitting, bike repair kit...). It occurs to me that, especially for men, at least one object that could be considered helpful for others has almost totally disappeared; the handkerchief. This object was ubiquitous before WWI, and now who carries one? That's a shame, really, because it was the only object that a man would carry routinely whose purpose could be classified as at least box 4, or maybe box 3 with respect to women and children (a man would be expected to have their own). A couple months ago, I got some fast food at the mall, and the teenager behind the counter said, "You're the second lady with a legit wallet I've seen this week. Most of 'em carry these big bags." I'm not sure what to think of the fact that he felt moved to comment; certainly nobody but my mother has ever commented on the fact that I don't carry a purse before. I note you don't mention tampons a whole area of interest for women and girls and a rich field for study of interactions etc. Did you buy a 'man-bag'? The third gender: parents of small children. Everything goes in the diaper bag. style and make you amazing. I've always been interested in how other women learn to carry purses, since I actually got taught to by my mom after I lost my asthma inhaler at a roller rink. I got taken out for it first bra style and told to keep an eye on it in public and such. Where do keys go in this graph? They kind of change, since sometimes they are carried just by one person in my family if we're going out, and sometimes they're just for me. They seem to change with gender too, since a lot of self defense items for women are key chains, and I would imagine you have a lot less keychains if you don't have a purse. I used to travel about one week a month, to meet a group of 10-20 colleagues at different workshops. Everyone had all sorts of bags, but we all tried to leave them at the hotel, etc. One of my colleagues and I quickly fell into a routine of relying on each other for items. He always had bandaids and aspirin, I always had antacids and tissues. He carried cash, I carried change. He checked luggage containing booze, I checked luggage containing snacks. We never coordinated any of this, but it worked out beautifully. FWIW - I carry my wallet in my purse.